Andrew Heney edges his feet forward, curving their arches around the rope. 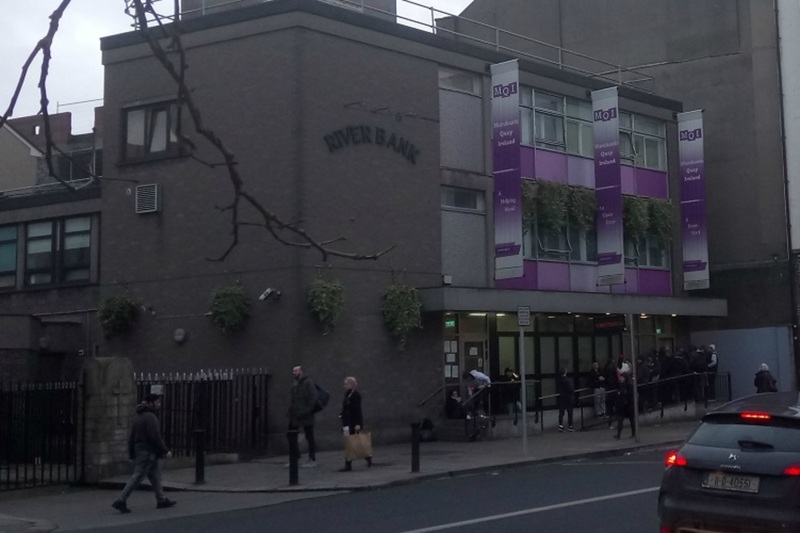 Wrapped around the trunks of two large trees, the purple line stretches 50 feet across the grass on Merrion Square. It’s Saturday, around 1:30pm, and a passerby stops to watch the balancing act. Rising to his full height, Heney sways his arms from side to side to keep his balance, dancing on the edge. The rope bobs up and down and, overhead, gulls cry. Suddenly, Heney hits the deck. “Woah!” he says. His legs fly up in the area, and his chest thumps onto the ground. He strolls back towards one of the leafless trees that his line is attached to. Nearby, Michael Murphy juggles on the verge. He’s another Dublin highline-head, but they’re few and far between. 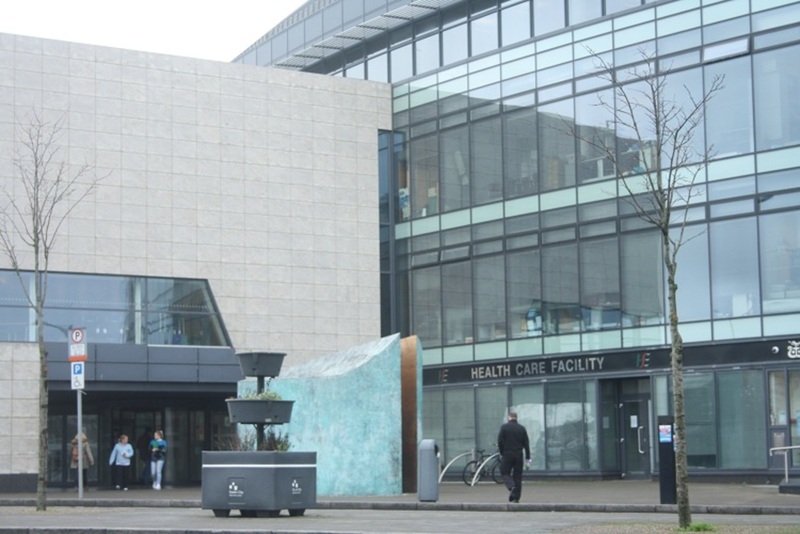 “If there are Dubliners doing this, they don’t come out and tell people,” says Heney. 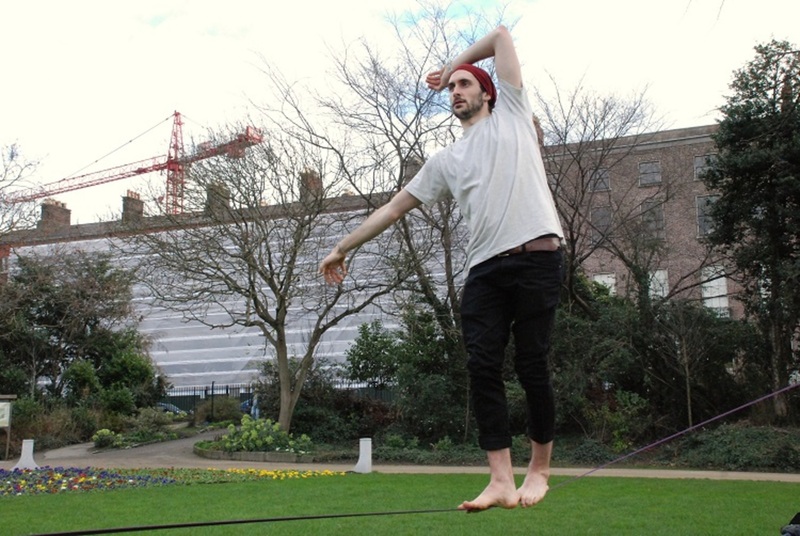 Slacklining differs from tightrope walking in that tightropes are tenser and often have attachments on the side. Murphy isn’t nervous about public performance. 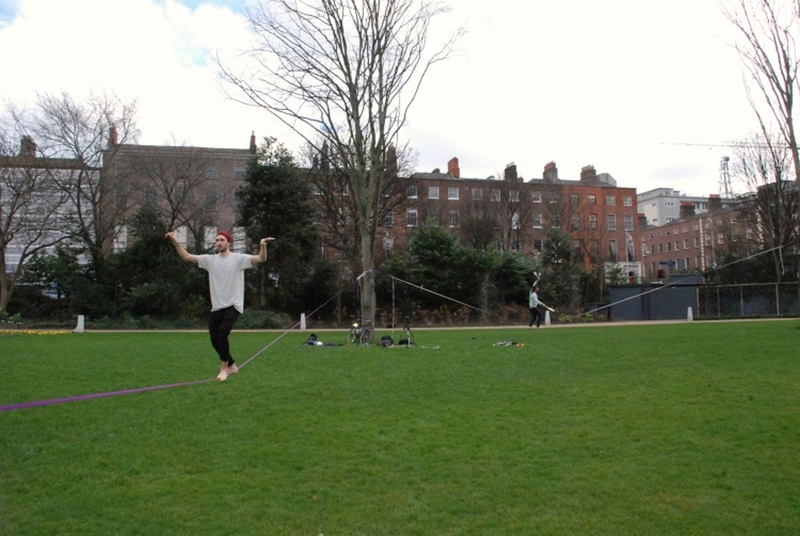 He’s been highlining – which is another word for slacklining, but with the rope strung up higher – for some time. Every few weeks he and Heney and whoever else cares to join practice somewhere in the city. Last time, it was Clanwilliam Place. 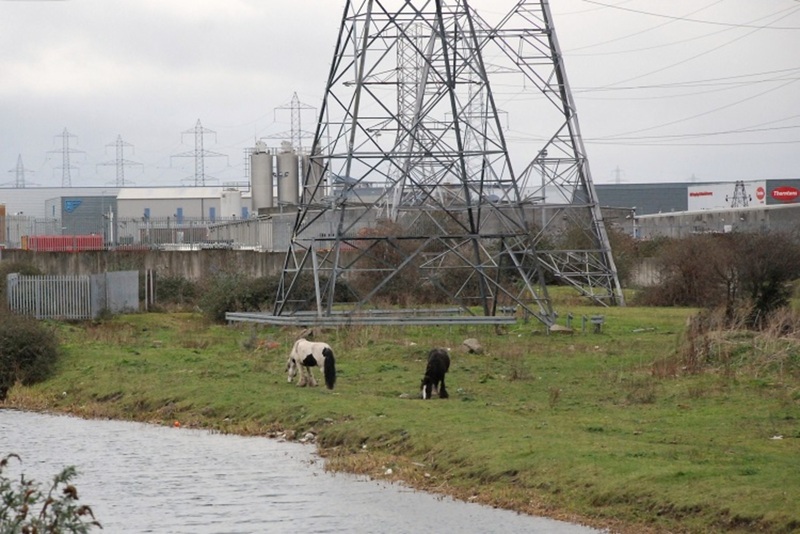 Before that, it was Portobello, where they stretched the line across the canal. “The reaction’s been really good,” says Heney. Near the canal, the manager of a pub came and took a video, then took them in for a pint. “So that went really well,” he laughs. For Heney it all started when he watched a documentary about climbers in Yosemite National Park in California. That was about 10 months ago, and he’s planning at the end of this month to head to a highline festival in Antalya, Turkey at the end of the month. But today he’s relaxed, his concentration almost a form of meditation. He mounts the rope once more, slowly shifting his body weight to ensure balance. Every few feet he progresses on the rope, he tests himself, lowering his body down until he’s completely horizontal, arms outstretched. To the right, Murphy walks another line, juggling all the while. The community of highliners is a far flung one. Social media, explains Murphy, plays an important role in connecting those seeking spots otherwise unknown. “It’s really nice that, like, anywhere you go in the world, people are immediately like, ‘Come on, get in my van,” he says. Ireland, unfortunately, has few precipitous drops, says Murphy. That might be one reason that we’ve never really developed a culture of highlining. Another highliner, Ronán, arrives and takes off his shoes and socks. But he declines to chat; he’s only just started. According to Murphy, the length of the line is key. If you hit the rope with your foot, waves will travel and then bounce back. The longer your rope, the bigger those waves become. “You continue to make it more and more difficult for yourself,” he says. 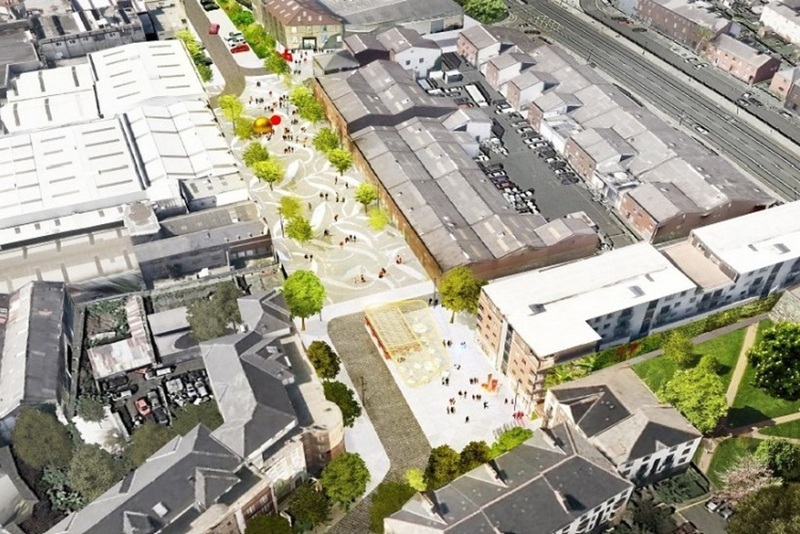 Dublin may not have the precipitous drops of Bogotá, but Murphy has one or two ideas in mind for places to highline here. As Heney practices on his purple line, he explains the different techniques for foot placement. 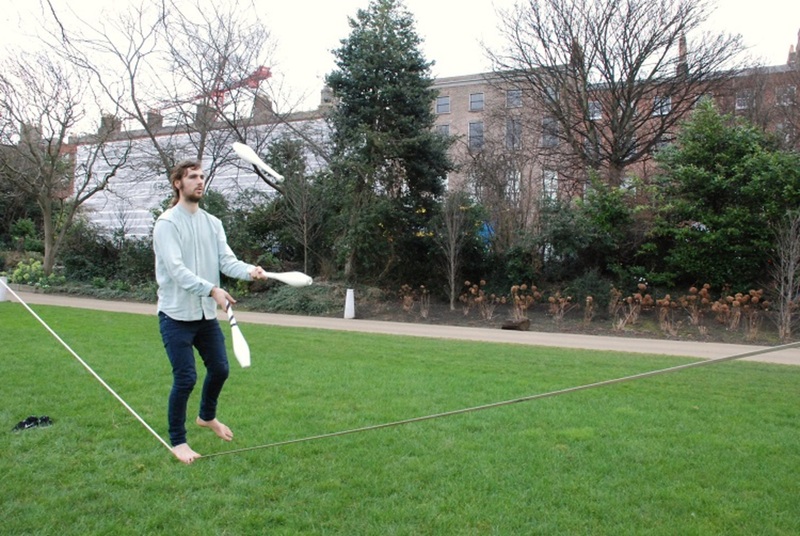 Eventually, Heney says, he might take part in trickline competitions – literally slacklining with tricks. But first: practice. Murphy says he can’t stop gazing at the Poolbeg Towers. Last year, he did a recce to check out the possibility of highlining between O’Connell Bridge and the Rosie Hackett Bridge. That’s about 50 metres, he says. Nice one Cónal, its a good piece.